Ask our liberals to name the most notorious person on this planet who simply can’t do anything other than doing wrong; the frauds would jump over one another in naming Narendra Modi as the answer. That is how our seculars are poised against NaMo, even now when he is the priminister of this country. The very louts who swear by our democracy and democratic frameworks can’t digest the fact that the same democracy has installed a person, who they hate with their lives, as the PM of this nation. It is a different matter that the person who these liberals wanted to rot in hell for no reason other than their pathological hate has gone above their hate and become what the nation wanted him to be. It is a different matter that after a decade long lie peddling, the man still stands tall or may have even risen a notch higher than what he used to be half a dozen years back. It is a different matter that the liberals don’t agree to accept that they lost the plot very badly. After all our liberals can’t stand an honest and delivering man at the top because they were too used to incompetence, corruption and skullduggery. That is where even the free money is. While the earlier agendas of the seculars were more or less peddling lies and projecting NaMo as the worst enemy of the minorities (read Muslims), now the agenda has changed. The agenda has to change because the earlier agenda didn’t bear the desired fruit. So there has to be a certain change of plans. Now the entire moronic brigade is busy proving how incompetent NaMo as the priminister is. And more off, how NaMo has left the entire nation at the perils of his whims and wishes. Though it seems like a good ploy at the face value the frauds don’t realize that the citizens have become much smarter today. They can see the lie straight and have the required acumen to analyze for themselves before buying any of their lies. NaMo’s 100 days as the PM and his Teacher’s Day speech coincide within a span of 5 days. That is good enough a fodder for the seculars to jump out of their closets and write all the filth in their possession. We had liberals of different hue and cry writing rims of paper on how Modi has disappointed them as a whole. As if they were ever in satisfaction with Modi. Wonder, why I never saw one of these frauds write even a single article on 2G, CWG, Coalgate back then? Nobody even wrote about the irony of having a democracy where we had a pawn as the PM in the form of Manmohan Singh whereas the real power center was with the queen and her retard son. None of these morons raised a voice when there was blatant misuse of power then. But come to present day, the same jokers are falling over each-other in name calling and abuses of grimy order. After all, the nation has to be saved from the claws of a holocaust like Narendra Modi. So the sentinels of the state are taking the fight on their own to safeguard the nation; no? Now tell me, would you find anywhere in the world where the PM is criticized for talking to the students? We will analyze the long term gain-loss or any hidden PR activity in that later but does any way a simple act of communicating with the future of the country looks wrong? For me, no. But the liberals smell rat as per their obvious nature. After all, it is something that Modi has done, so it has to be against the nation. Had the same thing been done by Rahul Gandhi, the same set of frauds would have gone gaga in hailing the Yuvraj and terming it as a path breaking step. They can’t praise the fact that a PM from his busy schedule took an entire day out for the students of this nation. The morons can’t see that the PM knows where the future of the country is and decides to engage with them to learn their problems, shortcomings and hindrances firsthand. Where there is nothing wrong in talking to the students, the liberals see it otherwise. 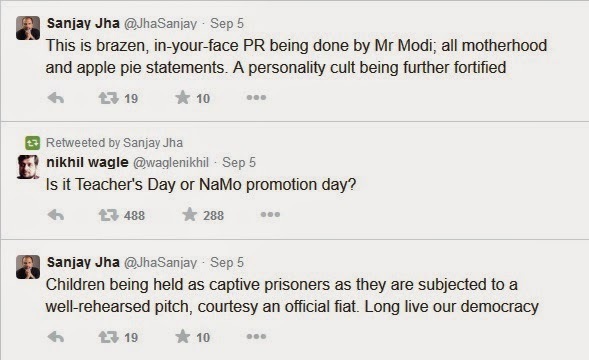 Leading from the front are two astounding scumbags, Sanjay Jha and Nikhil Wagle. For them, the said engagement was a PR activity. ‘A personality cult is further fortified’ shouts Sanjay Jha. Before analyzing the merit of his statement, may I ask – is there anything wrong in it? Or is it only reserved for the Chinese Gandhis to have their personalities fortified among students at young age for no credible reason? The personality advertisement is so chronic among the Gandhis that we now even have chapters on the retard Yuvraj as if he is one of the founding fathers of the nation. Students not knowing a line about Sardar Patel is fine but they must know in detail about each and every Chinese Gandhi and their extended family. Every city, small or big in India has at least 20 things named after the Gandhis; at least 80% of our government schemes are named on Gandhis; we have international airports, stadia, universities, IT Parks and hell even Sulabh Sauchalayas named after the Gandhis but ask these Congress stooges, they only see personality cult been fortified with NaMo’s Teacher’s Day speech. How more hypocritical can it become? Or is it for the Jhas and Wagles of the world that it is only the Gandhis, including the garbage called Sanjay Gandhi that deserve a mention in our history? Even a seasoned crook like Robert Vadra can have his airport frisking dropped but come to talk about creating a personality cult, the morons see it only in Modi’s address to the students. Even if Modi was doing a PR activity by addressing the students then also I don’t see anything wrong in it. 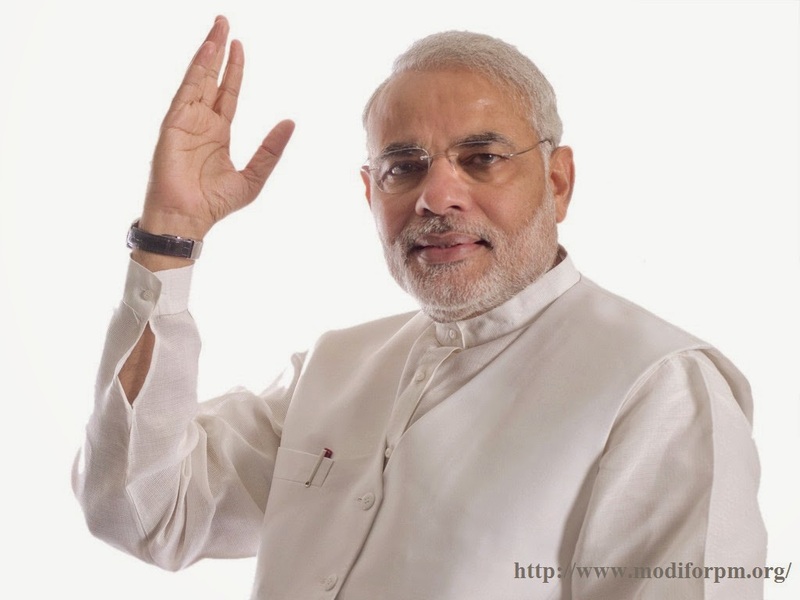 Every politician does it for his/her image then why so much clamor against Narendra Modi? When I see blatant lies being propelled to exaggerate the persona of a certain Rahul Gandhi or Sonia Gandhi then what is the harm in projecting the image of the PM, who is genuinely honest and hard working and wants good for the nation? Irrespective of who is doing the PR act, if in the process the students get benefited then I don’t see anything wrong in whole of it. For how many times one sees the students getting the opportunity to interact with their PM in one-to-one manner? Not only in India but across the globe. Honestly, I can’t remember seeing it in any other country where the state head dedicates one full day for the students. For the first time I felt the Teacher’s Day got its due quality of celebration than remaining a namesake as it used to be till now. But the morons find any such step of NaMo as wrong. Perhaps they are annoyed that how dare the PM, rather being busy in loot and corruption or defending his scam tainted ministers is busy wasting his time in talking to students? I mean, how the PM can dare to take some nation building steps? That is not his job. A PM’s job is to either loot or corroborate in loot or be present at the disposal of the queen at moment’s notice or SMS. But hold on. The annoyance is not without a reason. The seculars may not agree in open but privately they are worried that NaMo is becoming larger-than-life with his stature. And more important, he is becoming larger-than-life for genuine reasons unlike the Chinese Gandhis who were more-or-less shoved down the psyche of the nation through vilified propagandas. They know if this man is left to grow the way he is growing now, the Gandhis would be forgotten quite quickly. The louts need to find a way to counter a rising NaMo before it is too late. So how the morons would counter Modi? Yes, they must go back to history which they claim was the golden years for India while in reality was as deplorable as rest of their 60+ years of governance and find characters to pit against Modi. After all their prolonged business of selling snake oil to young kids by teaching them all the wrong history should come handy now. And no persona other than that of clueless Nehru should qualify for the bait. He was the only person who built India, you know? Though his association or love for children never goes beyond that single photograph where he was seen holding a child while smiling like a pervert at the mother, he still would be hailed as the biggest lover of children. Ask Sanjay Jha again for details. As per the scumbag Jha, Nehru is the rightful perpetual Chacha for the entire children mass, generations after generations. Because he had immense love for children though there are no proofs to substantiate it. If only facts could be accepted in this murky world of Congress sycophancy, here is at least one. I can’t remember a single child centric policy that Nehru brought in during his regrettable tenure. Let alone doing anything credible for children; Nehru in fact truncated the budget for education against the wishes of Sardar Patel. But then, this is how history is distorted and this is how the Chinese Gandhi worshipers spoil the brains at a young age. After all Romila Thapar School of history has its utility. Kids as early as 4 years old are told all the false stories of a womanizer clueless entity. Not only that, they are asked to even adore a pervert as their loving Chacha. For once, when I was a kid, I was head-over-heels in love with Chacha Nehru because he was our loving Chacha. It was when I read some correct history later my perception towards this person turned south. But I doubt if all of us are interested to learn the right history or even get a chance to do so. So that is how the false legacies of a man called Nehru continue to harbor in our society whereas the word that best suites the legacy of Nehru is – DEPLORABLE. When we were fed with the poison called lie from the beginning what is the harm if the Sanjay Jha types propel the age old lie a little further to safeguard one particular family? It is a fair deal. Gandhis are Gandhis and they are, were and will always remain the best thing happening to India. By the way, Narendra Modi is an idiot and can’t do anything good, even by mistake. Unusually large number of typos, BC. Hey thanks for pointing. Though, I wrote this one in real hurry (precisely 10 minutes), I don't see any typos. I may have missed though. Could you please help me in picking out those? Sanjay Jhat is just a "bhaade ka tattoo", he holds no public position, so he is not afraid to lose anything by making any statement. He is just paid to give useless remarks and take public thrashing. He is just a low life who is doing the job of taking all the abuses on behalf of his crooked masters and licking boots. I mean at some level, you gotta appreciate his complete lack of self-respect and shame, by which virtue he is making a lot of money..... At lease I wont be able to do it for any amount of money. as well... Even this is a mistake ? had this been done by any congressi... it would have been difficult to find more flowers in the country to garland RG for the act, If namo does it - comes a blake - look at your own country first. You are right..even we were fond of "chacha" in our school days. Thanks to our history books and teachers. Nehru's bithday infact should be celebrated as "womanizers day"
2. Freedom at Midnight - written by the pair of French writers. Lord Mounbatten quite candidly stated that his wife was close to Nehru. He did not have any great love for her. He said that her used her proximity to Nehru to influence him on matters that he needed his way. Such was Chacha Nehru who was willing to sacrifice the nation's interest to pursue his passions. History writers should refer to these books and correct the distorted history being taught to impressionable minds. The Gandhi - Nehru family is big fraud on this nation. And MK Gandhi is partly the reason for it.